Manage your Grata users on the Grata backend from the My Team section. Encourage your team to use individual agent accounts so you can track who on your team spoke with which customers in your conversation history. After you’ve opened the Admin Panel, click on “Users” in the side menu under “My Team”. Click the blue button to Add Agents. A name and unique email address are required. Selecting the agent’s language sets the language of the invitation email that contains the agent’s password and log-in instructions, but the agent can change the language of their console at any time. A Grata user can either be an Agent or an Admin. Agents do not have access to the Grata Admin Panel. Admin users have console access like Agents do, but also have full access to all Grata backend functions and controls. WeChat gives verified Official Accounts the option to personalize chats with custom agent avatar images and names. Agent IDs can be used by more than one user allowing you to use individual agent names and photos or team identities. Your Agent IDs are managed on a separate page, but you assign them here on the agent’s profile. By default WeChat allows accounts to create 100 different identities. 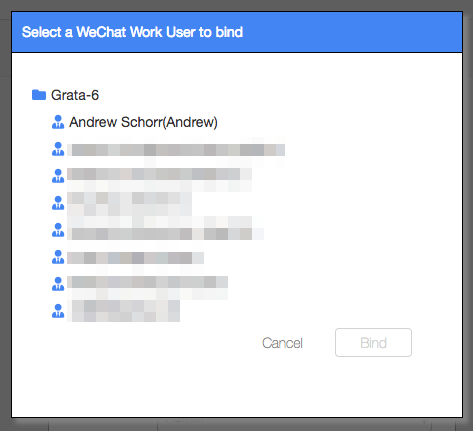 You must activate this feature on the WeChat backend before you can manage them in Grata. To do this, login to the WeChat backend, click “+ Add Plug-ins” (+添加功能插件）from the side menu, then click on the Customer Service feature (客服功能), and on the next page click the green button to enable (开通) the feature. You’ll also need to make sure you’ve set a WeChat ID for your Official Account. 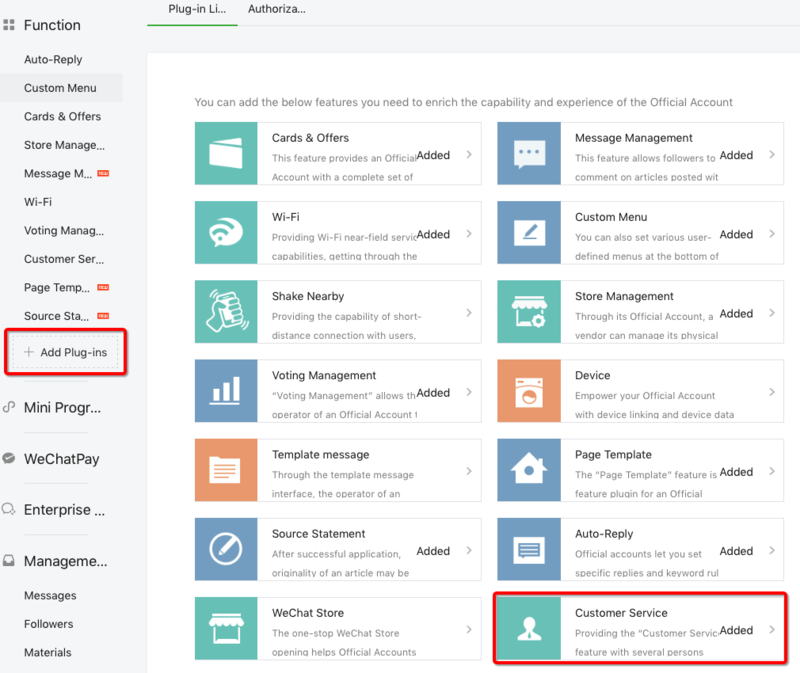 Still on the WeChat backend, check on the Settings < Account Details page that you have selected a WeChat ID in the second row. The custom avatar feature will not work if you have a default hash for your WeChat ID. The WeChat ID can be modified only once per year. If you don’t use the WeChat Agent IDs, all messages will be sent with your WeChat Official Account logo as the avatar. If you use specialized routing rules for your account, you can designate agents to handle specific users by assigning that agent a User Group. User Groups must be first created on the Grata Routing page. 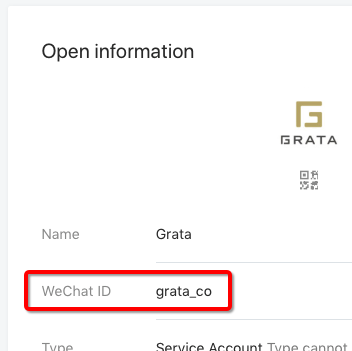 If you have already linked a WeChat Work account to Grata, you can link your Work users to your Grata users at this time. 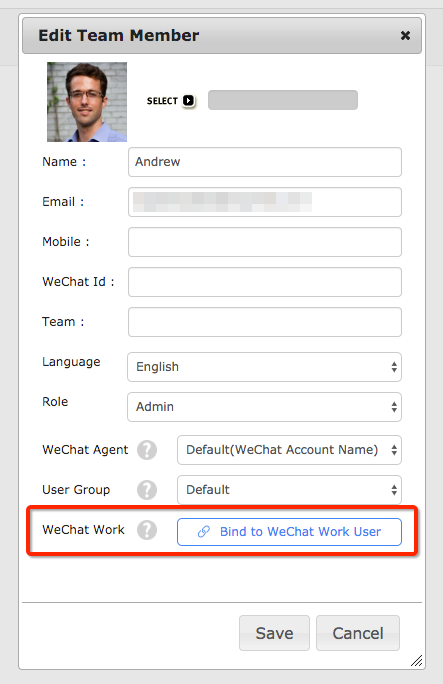 Click the button to bind that user to WeChat Work. 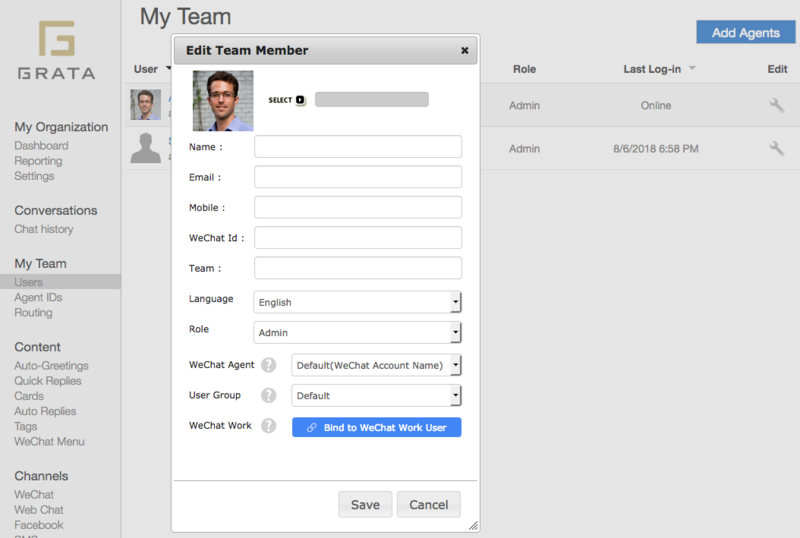 Clicking on the button will reveal a list of all your WeChat Work users that are designated to use the Grata apps. Users are displayed in the format of username(Work ID). Select the appropriate user and click bind. After you click save, Grata will email an invitation with a password and l0g-in instructions. You can resend or cancel the invitation by clicking on the wrench icon. Click on the wrench icon of any active agent to disable their account. For security purposes, you should regularly review your list of active users and disable any users that have left your company.